No artificial preservatives, colours, flavours or filler. Added vitamins, minerals and taurine. TEMPTATIONS® All Natural Free Range Chicken is rated4.8 out of5 by34. Rated 5 out of5 bySasha fromKitty loveEverytime i do a gricery shop the kittys get a pack each and they actually wait ( not so patiently) as i put away the groceries amd get to their special treat. My oldest daughter actually gets them a xmas stocking and puts one in there to.it was my youngest kittys forst xmas and it was so cute cuz he didnt need help opening his stocking he actually ripped into on his own and took out his bag of temptations and proceeded to rip into that @ he woulda got it open if i didnt stop him and open it properly .little to say i gave him a few xtra for xmas and for being so darn cute! Rated 5 out of5 bybeth frommy cats absolutely love this productI have been buying Temptations for years for my cats. They absolutely love it. They go to the pantry and stretch up the door or sit there looking at the door till I give them the treats. They do this EVERY time I'm in the kitchen, that's how much they love them. Awesome job. I thank you, my cats thank you. P.S. further down the page it asks, "did you receive an incentive for this review?". I'm not sure what you mean by this question. The only incentive I had were my cats, otherwise I would have said "NO"
Rated 5 out of5 bylindan fromNaturals Tempations Chickenmy can can not wait til i get out of bed to feed her the treats , she loves them . and you shake the bag and hear she comes. Rated 5 out of5 byCat1 fromCats just luv themWhen I get up my cats run downstairs and are waiting for me by the couch to get their treats and around 10/10:30 in the evening they come back and start talking to me asking for their nighttime treat again. It’s so cute. It’s like a daily routine. Rated 3 out of5 bynatty fromloveMy 4 cats loves these treats. One of my cats dislike them since he has a sensitive stomach. He hears the noise of the bags and knows its treat time. He loves all the flavors. The ingredients are not healthy but i'm broke so I buy them. 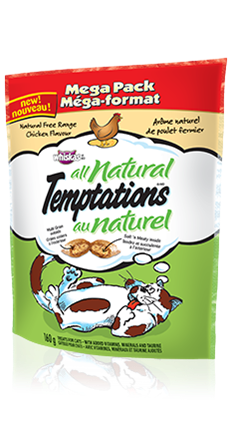 Rated 5 out of5 bytbenn fromMy cat loves them!Have been buying the All Natural Chicken flavour for a while now, my cat definitely loves them. Just got to give the bag a shake and he comes looking for a treat! Would highly recommend and will continue to use for my kitty cat! Rated 5 out of5 bySweety fromOnly healthy treat my cat eatsIm always looking for a healthy snack for my cat unfortunatly shes very finnicky and doesnt like any of them the all natural temptations she loves its the only treat i can get her to jump on and finish for sure ! Chicken Meal, Ground Corn, Animal Fat (Preserved with Mixed Tocopherols), Dried Meat By-Products, Brewers Rice, Wheat Flour, Natural Flavour, Grain Distillers Dried Yeast, Egg, Dicalcium Phosphate, Potassium Chloride, Choline Chloride, Salt, Taurine, DL-Methionine, Calcium Carbonate, Vitamins (Alpha Tocopherol Acetate [Source of Vitamin E], Vitamin A Acetate, Niacin Supplement, Vitamin B12 Supplement, Riboflavin Supplement [Vitamin B2], Thiamine Mononitrate [Vitamin B1], d-Calcium Pantothenate, Vitamin D3 Supplement, Biotin, Pyridoxine Hydrochloride [Vitamin B6], Folic Acid), Minerals (Zinc Sulfate, Copper Sulfate, Manganese Sulfate, Potassium Iodide), Natural Free Range Chicken Flavor, Mixed Tocopherols (A Natural Preservative). TEMPTATIONS® Free Range Chicken Flavour Treats for cats is formulated to meet the nutritional levels established by the AAFCO Cat food Nutrient Profiles for all life stages. AAFCO stands for the Association of American Feed Control Officials. AAFCO develops standards for dog and cat nutrient profiles which are used as model regulations in the United States. AAFCO feeding protocols are referenced the ""Guide for the Labeling and Advertising of Pet Foods"" endorsed by the Competition Bureau of Canada as well as in the Guidelines for the Canadian Pet Food Industry, developed and administered by the Pet Food Association of Canada. These documents were created to help pet food manufacturers ensure that the food that they manufacture, distribution and sale of animal feeds are safe and of high quality.